ingeniously or unnecessarily complicated in design or construction. 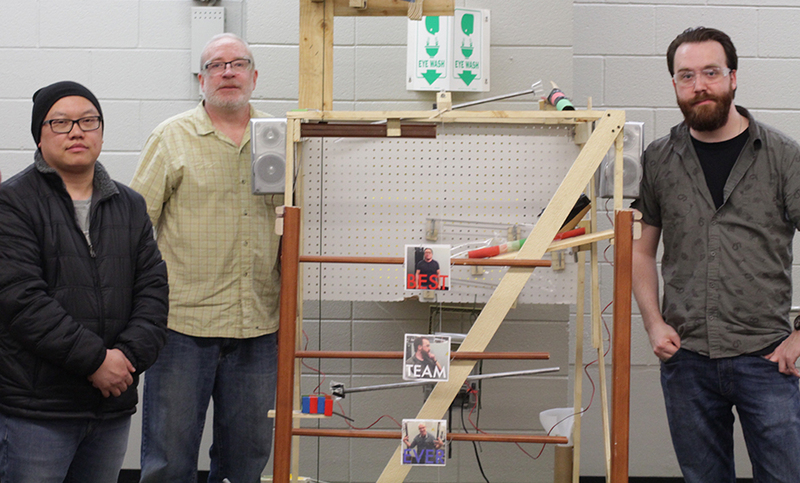 It took them weeks to build, included hundreds of parts and dozens of steps—and it was over in a matter of minutes. But the end result couldn’t have been more perfect. 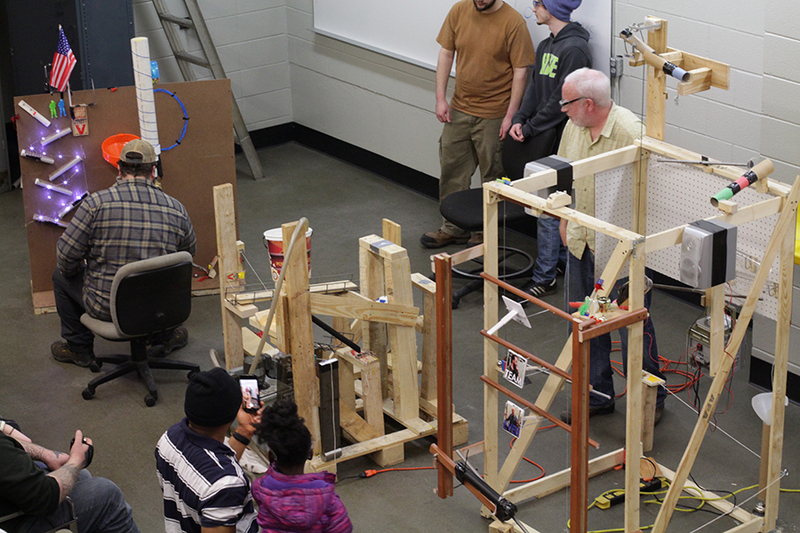 Five teams—each comprised of three Machine Tool Technology students—recently demonstrated their creative thinking and problem-solving skills when they were challenged to build a Rube Goldberg machine. Each machine was to involve a series of devices performing simple tasks, all linked together to produce a domino effect in which activating one device would trigger the next. A minimum of 10 steps per machine was required. If all of that wasn’t complicated enough, the students decided they also needed to up the ante. Part way into the project, the teams decided that every one of the machines should also be linked, and that the last step in each machine should trigger the first step in the next team’s machine. And it was up to each team individually to decide exactly how that would be accomplished. 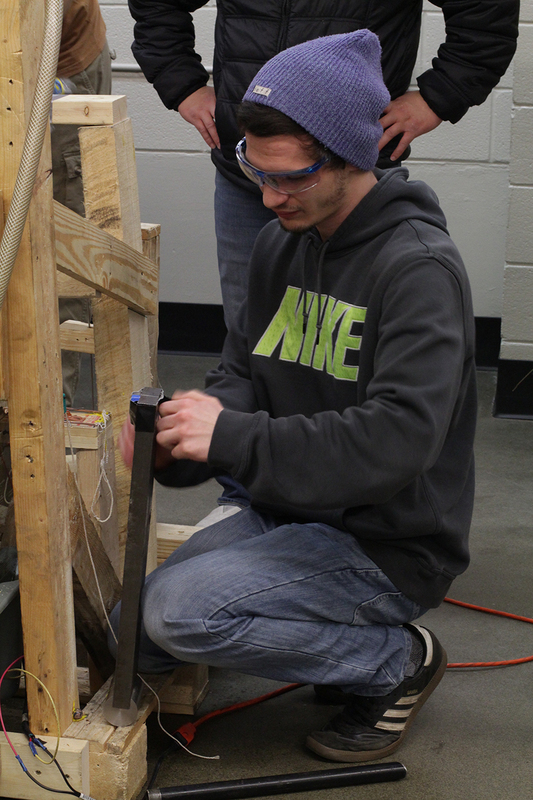 “It all worked flawlessly,” said Russ Gallaway, a Machine Tool Technology student. That “flawlessness” was the result of working one to two days a week for about a month on the project. When completed, each machine was about 4 feet deep and 5 feet tall. “It was all about creative problem solving,” Gallaway said, adding that his team, which included Young Pha and Marc Leahy, put their machine together with spare parts they scrounged from home and found in the trash. Learn more about Machine Tool Technology.